With history that spans over 100 years, Giebels Meat Products has vast experience processing meat into a delicious end product. Selective purchasing of top quality beef, pork, chicken and other ingredients guarantees a top quality end product. 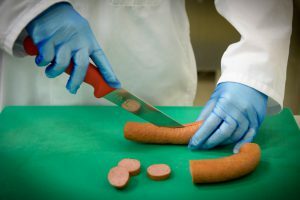 Giebels Meat Products is anticipating a rapidly growing consumer demand for ready-to-eat products. The production of pre-cooked meat products according to precise specifications is our speciality. 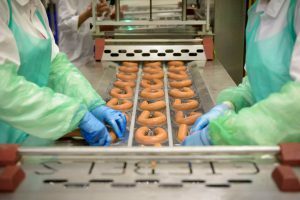 The sales market comprises customers from the retail and food industry both at home and abroad and the scale of the production process guarantees that buyers are provided with the continuity of consistent high quality. As a result of increasing demand in the market, Giebels Meat Products bakes and fries without fat and this leads to a very tasty product without residues. 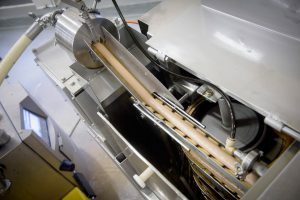 Our fully automated sausage co-extrusion line produces a range of sausage varieties including smoked sausage, frankfurter and breakfast sausage. Our power lies in high production volumes with a high degree of flexibility. If the customer so desires, we develop tailor-made products and, in order to do so, we use our competitive production lines. The aim is good quality with high added-value for our customer. Our range includes pre-cooked, marinated meats such as spareribs, chicken pieces, sausages, meatballs, hamburgers and other meal components. It is important that the traditional character of the product’s taste and appearance remains intact. If required, the products can be delivered in large of consumer packaging, under individual or private labels, frozen, vacuum packed or gas packed. In addition, we supply cooked meal components for use in soups, salads, etc. 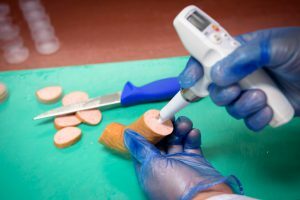 Traceability, flavour consistency, structure and shape are guaranteed with Giebels Meat Products. All our products are checked by a panel before release. We are also HACCP and BRC certified. 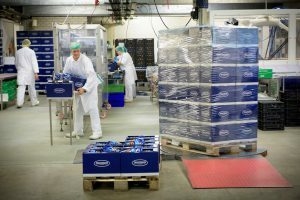 Giebels Meat Products realises that collaboration is essential for success in these times of differentiation and speciality. With over one hundred years of experience in the meat sector, Giebels Meat Products is a professional partner with whom you will be successful.